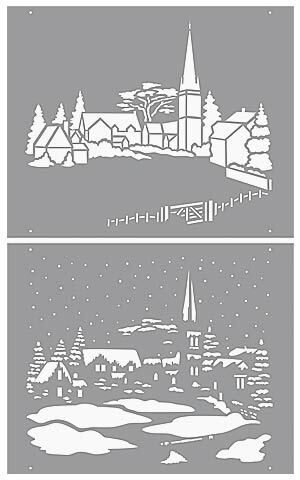 The Snowy Scene Stencil – depicts an idyllic village scene in winter snow, with house lights ablaze, church spire and snow laden fir trees – the perfect Christmas stencil! 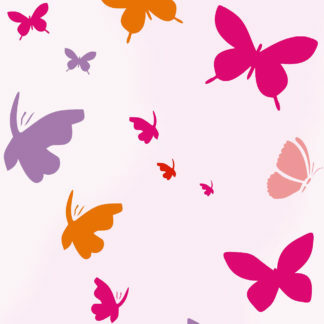 This stencil can be used as a single motif design or repeated as a snowy scene border stencil – it comes with registration dots for aligning both repeat prints and the two layers. See size specifications below. 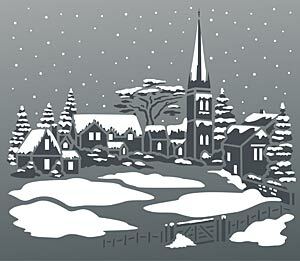 See our smaller version of this design – the Little Snowy Scene Stencil. 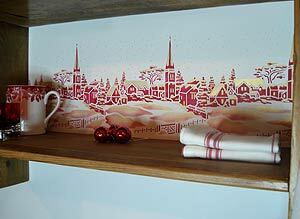 Above and top – use the Snowy Scene Stencil repeated as a border to give an instant festive lift to book shelves. 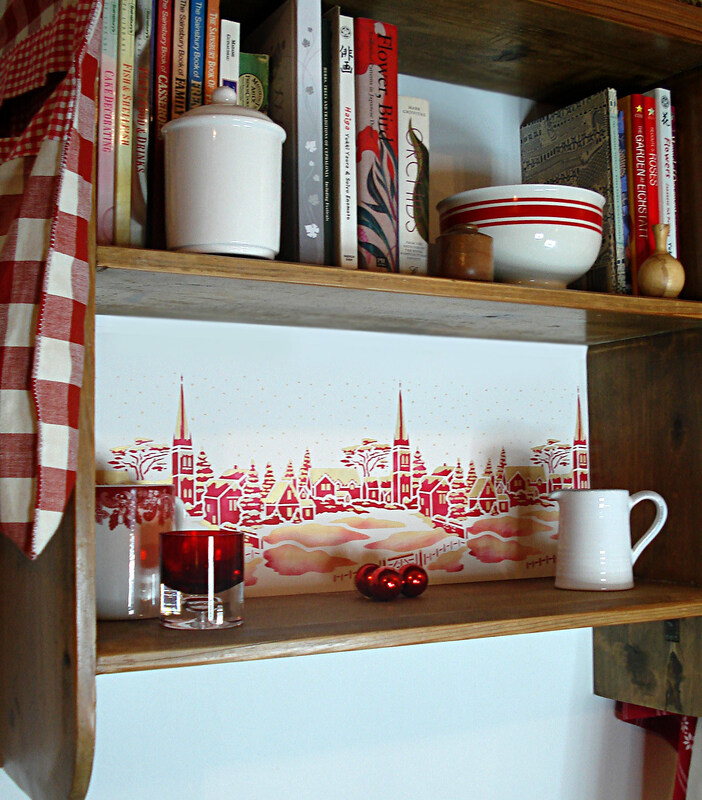 Stencil simply on art paper and use double sided tape to stick to the back of the shelves – easy to remove and you can keep it for next year too! Our shelf frieze has been stencilled in Raspberry Stencil Paint (layer one and blushed on snow sections for layer two), Nougat Stencil Paint as a base for layer two and over-stencilled with Antique Gold MetallicStencil Paint. You can also use a darker colour for picking out the falling snow. 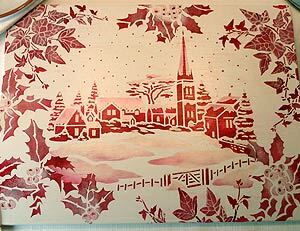 Above and below – the Snowy Scene Stencil repeated as a border in Raspberry and Ice White Stencil paint on a grey background. The Snowy Scene is repeated three times using the integral registration dots to help with repeat alignment. 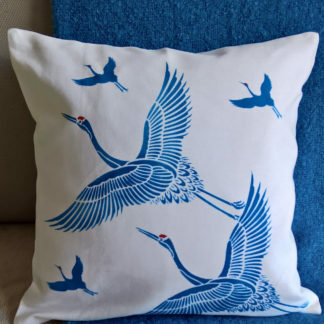 Shown in Arctic Grey and Ice White Stencil Paints. Above – the Snowy Scene Stencil shown repeated twice in Storm and Ice White Stencil Paint on a lavender-grey background. 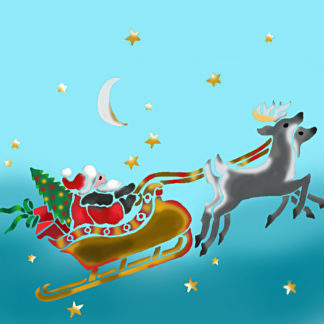 See also the Little Snowy Scene Stencil – ideal for gift cards and boxes. 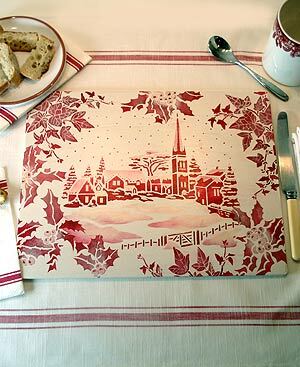 Above and below – inspired by vintage red and white crockery we created these beautiful toile-like winter scene placemats with our gorgeous Snowy Scene Stencil, framed with the motifs of the Little Ivy Stencil and Holly Stencil. 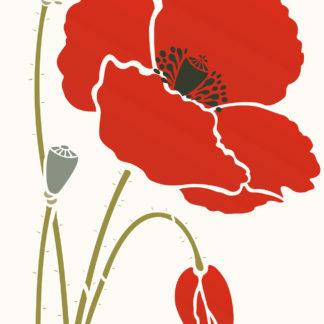 Above – close up detail of the festive placemat. 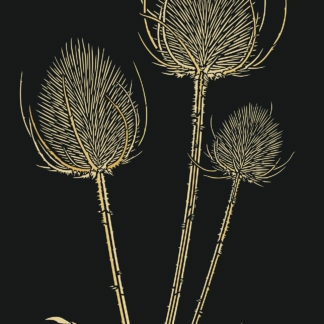 Restricting your palette to two festive tines creates this unified effect. Stencilled in Raspberry and Nougat Stencil Paint with Pearl Metallic Stencil Paint highlights. See How to Guide below. 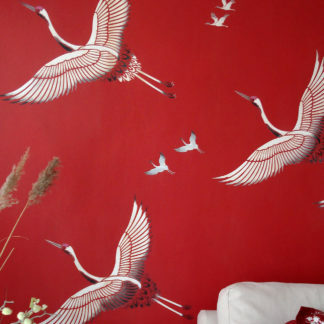 Above – the Snowy Scene Stencil shown as a single motif in Raspberry, Cerise and Ice White Stencil Paint on a grey background. Above – use darker shades to create more atmosphere with the Snowy Scene Stencil in Arctic Grey, Jet Black and Ice White Stencil Paints on a dark grey background. We simply cut some 9mm thick MDF (medium density fibreboard) into rectangles of 33cm/13″ x 25.5cm/10″ and sanded until smooth, rounding the corners slightly with sandpaper. We then painted with two coats of our Vanilla Stencil Paint on both sides of the boards, sanding again after each coat of paint. The Snowy Scene Stencil was then positioned in the centre of each placemat board and stencilled with Raspberry Stencil Paint for layer one and Nougat Stencil Paint for layer two, with Raspberry ‘blushed’ around the edges of the snowy shapes in the foreground and Pearl Metallic Stencil Paint used to create highlights on layer two. 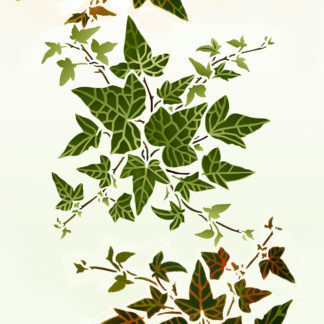 The same colours were then used to stencil the motifs of the Little Ivy Stencil and Holly Stencil around the edges of the placemat to create a natural festive botanical border. The Little Ivy Stencil was stencil with Nougat for layer one and a little Pearl Metallic Paint and Raspberry for the layer two leaf details, giving real depth. The Holly was stencilled in Nougat for the berries and raspberry for the leaves with a little dash of Raspberry being hand painted onto the berries. We then sealed the placemats with two coats of our Acrylic Eggshell Varnish. leaving plenty of time between coats to allow the varnish to cure and harden each time – this makes a more durable surface. The mats will take warm plates, but are not designed as pan stands. The Snowy Scene Stencil is a two sheet two layer stencil with registration dots for aligning repeat motifs and the two layers together. 125 micron Mylar. With full usage instructions. 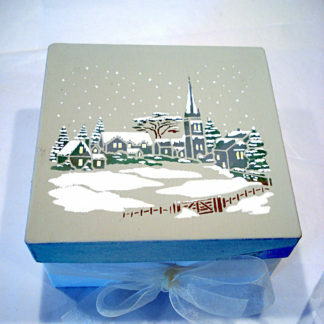 The Snowy Scene Motif measures approximately 22.2cm/8.75″ wide x 20cm/8″ tall. The church and spire is up to 19cm/7.75″ tall. Sheet size 26cm/10″ wide by 21cm/8.25″ wide. Left – the two stencil sheets of the Snowy Scene Stencil showing the layout of both layers and registration dots.